This is a very full-featured phone, with a lot of great capabilities. If you're looking for a phone plus an MP3 player, FM radio, and camera, this may be a good choice for you. The phone does not have built-in GPS. As low as $200 from Rogers if you take a first-time three-year contract. As low as $300 from Rogers if you have an existing contract and extend it for three years. $410 direct from Sony Style Canada, without any contract. Minimum user available memory: 64 MB (mine actually had about 74MB free). 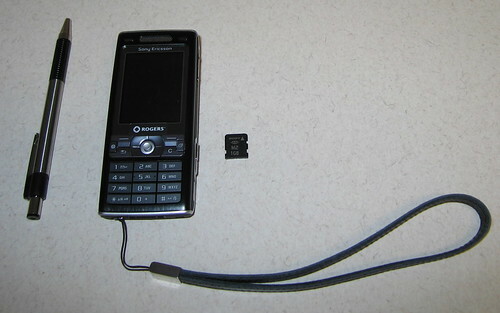 Expandable with Memory Stick Micro (M2) card. Used a 1GB card, $55 from Sony Style Canada. Current maximum available is 2GB. Headphones, power, USB etc. connect with proprietary Sony Fast Port connector. Power cable has passthrough to connect another Fast Port accessory while charging. It also charges automatically when plugged into USB (which may save you hauling around the power cable, e.g. if you have a laptop). Adapter to use regular headphones is available. This phone has a huge number of features, I will walk through the ones of interest to me item-by-item. As some background, I had a number of drivers. I wanted to see what the state of the art was for cellphone as integration platform. I wanted to have a camera all the time, without having to remember to bring my Canon PowerShot, so that when I'm walking down the street and think "hey, that would be a great shot" I can actually take the photo. And I dreamed that perhaps the phone GPS + camera capabilities might let me automatically geocode photos. 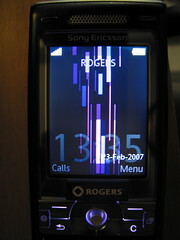 I also wanted international roaming, but most any Rogers GSM phone on a contract plan would have given me that. First I did a quick comparison survey to see what advanced phones were available and coming, and picked the K790. Check the survey for more info about the K790's capabilities. I learned a few things: one, there is a "conceptual" base unlocked phone, and then there is the actual phone as modified by your wireless carrier - not all features the phone supports may be available. Also, wireless Internet over cellphone from Rogers is bloody expensive, which limits a lot of the Java Internet stuff you may want to do. 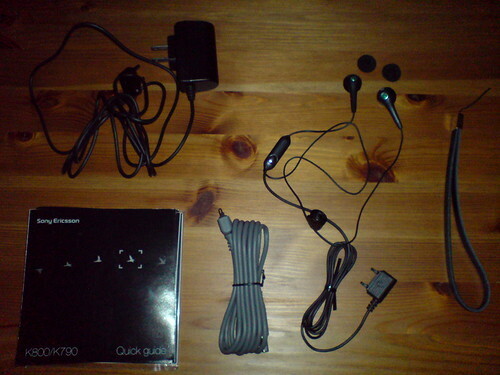 It comes with lots of accessories: power cable, USB cable, headphones/handsfree microphone. It comes with a CD, many many drivers are installed, including modem and Ethernet capabilities. It does not include the Sony Picture Motion software that comes with some Sony Cybershot cameras, which means that the automatic map integration provided by the Sony GPS-CS1 is not available (you can still use the Sony GPS software and software like RoboGEO - see my GPS-CS1 review for more info). 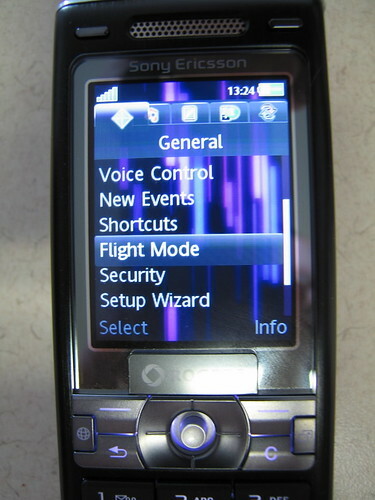 There are two modes for connection: "Phone mode", in which the phone continues to operate and in which you can do file transfers. 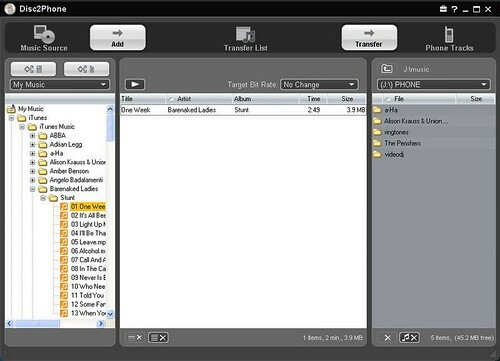 Then, confusingly, USB "File Transfer" mode, in which the phone ceases to operate (in terms of receiving calls), and which is required in order to use the music transfer (Disc2Phone) and photo download (Adobe Photoshop Album Starter 3) software. 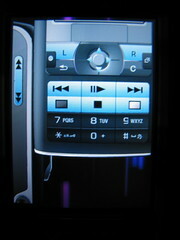 The interface on the phone is the usual navigation by Artist, Track or Genre. You can also make playlists. Can you listen to your tunes on the plane? Yes. There is a flight mode that turns off all the radio features (cellphone, FM radio, Bluetooth). This may seem like a somewhat obscure need, but I actually bought my iPod mainly to listen to audiobooks on the plane. Requires the headphones (the headphone cord is the antenna). Works well, nice clean interface. is not supported by Rogers. The built-in email client is actually quite powerful. It's available under Messages->Write New->Email or you can access your email inbox and settings (separate from your text message inbox and settings) under Messages->Email. Note that this will use your data plan. I set up a Rogers Internet secondary account for my phone, but presumably you could use any POP or IMAP accessible email account (e.g. 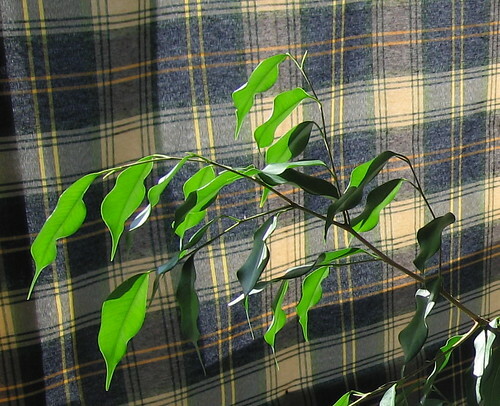 Gmail). No Advanced Settings need to be set (although you might want to set Your Name). That's it. You should now be able to send and receive emails, including sending photos. 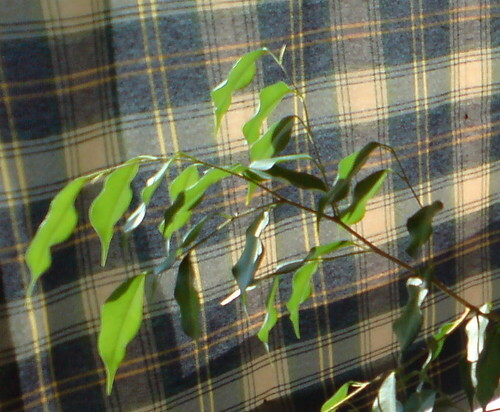 Note: Sending photos by email doesn't work from the photo browser (Cyber-shot->View->Send->As Picture Msg.) - even if you select an email address, it will send the photo to picturemessaging.rogers.com and send an email to the selected address to check out the photo there (Rogers trying to lock you in to their online photo service). Turn sideways. Open camera lens cover. Press focus button - focus button has a slight metal bump next to it - sometimes press bump by mistake. Entering in your username and password (and any textual information) is quite tedious though. The phone seems to have a bit of a split camera/phone personality. but none of my photos are there, just some pre-loaded little images. Well, that wasn't confusing or anything. I have to copy pictures from the... phone... to the... phone. Why doesn't Camera Album come up as a choice in the Select Files automenu? What's the difference between "Camera Album" and "Camera Pictures"? Anyhoo, once you have the image copied into Pictures it can be... slowly... uploaded. It is NOT automatically geotagged/geocoded. Rogers has its own, rather confusing, online picture service. Pictures I had sent were in Messages->Stored Messages, and could be copied to a photo album from there. It's not clear to me whether "photo album" images can actually be shared on the Internet, or only sent to other phones via MMS. I'm afraid I have to characterize the camera in the K790 as merely adequate. This is not too surprising - there is not much room to put in good lens optics - as it is, the lens is a bulge on the back of the phone. I find the K790 tends to have substantial blur on edges, rather than having clean sharp lines. And I am not a particularly picky photographer. That being said, the camera is more than fine for sending picture messages or even taking casual pics - which is all I wanted. UPDATE 2007-03-02: There is an option to choose between "normal" and "fine" (higher-quality) photos, in Settings->Picture Quality. I believe that "fine" mode just adjusts the JPEG compression, thus resulting in larger image files where more of the fine details should be retained. The camera has many settings, just like a regular digital camera, I won't go into them all. I recommend the extensive review of the photographic capabilities from Mobile-review.com, as part of their detailed examination of the K790. The software that was best was j2memap. A bit difficult to get the right version installed (I managed to get 0.914 eventually) but then very smooth - it requested access to the Internet (I assume this is combination of the phone and Java doing the request) and then was able to locate the Bluetooth GPS I had paired with the phone (my Holux GPSlim236). Pulled down the Google satellite image of where I was standing, very cool (and as I mentioned before, unfortunately very expensive due to Internet costs on the phone). You can take a picture using the software and it will send it to Flickr along with the geotags for your location. Therein lies the "almost" automatic bit. It's not clear whether Flickr will, in the background, convert machine geotags (geo:lat, geo:lon) into a map link, or whether you have to manually run Flickr's (hidden feature) Geo Import each time. It also doesn't appear to be possible to set either photo privacy or location privacy when uploading. Anyway, kudos to the j2memap people for an amazing application - it's a shame I won't be able to use it much, due to the outrageous 3 cent to 5 cent per kilobyte Internet data charges from Rogers. I also attempted to use Shozu, but it asked for a whole bunch of Java rights settings, and then wanted me to enter a bunch of APN info for Internet access that I know nothing about, and I'm pretty sure they asked for my phone number too. The strap itself is thick, but it connects to the phone via a very thin string; I am dubious about the ability of this string to withstand much abuse. Worst of both worlds - thick inflexible strap with thin connection to actual phone. The ability to automatically update the software on the phone is provided. I do not recommend this procedure, unless you either have a major bug you know will be fixed, or a major feature that will be added. You are basically doing a firmware replacement - anyone familiar with this term will already be shuddering. You have to remove the SIM card and place the phone in a special update mode. The problem: if the update fails, your phone may be dead. Totally dead. No power-on, no way (AFAIK) to reset. As you may guess, this happened to me with the update process, which reported rather bizarre completion percentages, then died partway through, declaring "your phone software is up-to-date". My phone was, in fact, totally dead. Very fortunately, I was able to reboot and re-run the update, which completed successfully and brought my phone back to life. This is easy to do, just stick the card in the side. As with many such devices, it has quite a strong partitioning between the memory card and the internal phone memory - you have to designate stuff to go to one or the other. While there is no Mac software, you can just plug the phone in as a USB drive on the Mac, if you want to download photos or upload music. You don't have to do anything special, just put it in file transfer mode and plug it in. 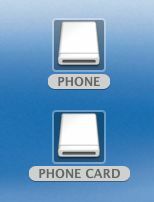 The phone and memory card show up separately. 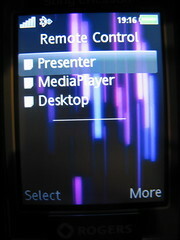 The above shows the screen that comes up in Presenter mode, showing the remapping of various phone keys. The main controls for slides are the up/down buttons on the right side of the phone - very nice ergonomics if you're holding the phone in your hand - just use your thumb, no need to even look down at the phone. Fired up Keynote 3 and started playing a presentation - clicking the slides back and forth just worked automatically. Also worked fine with Mac PowerPoint X. My preference when presenting is to be able to walk around, and I've always wanted one of those clickers that some presenters have, but I was never willing to shell out for one, particularly without being sure that it would work with the Mac. A nifty addition to the phone, and kudos to Sony Ericsson and Apple for making it all work more or less automagically, although it's not entirely clear to me how to reconnect for Remote Control without having to re-do Bluetooth discovery on the Mac again. Another potential external device consolidated into the phone. And for the sharp-eyed amongst you, yes, Remote Control - Desktop option makes the phone work like a remote mouse, the mini-joystick on the phone can be used to remotely control the mouse pointer, and you can do mouse clicks and access a limited number of keyboard keys as well. Also kind of cool although I'm not sure I will ever use Desktop mode in practice. Phone so good at power saving it's difficult to tell when it's on. Very quick to black screen. No time or charging display (when in black screen powersaving mode). "Themes" create somewhat distracting screen - time for some reason either tiny and hard to read, or larger but faint and hard to read - would prefer to have nice bright clear time on the display. Couldn't find a built-in theme that didn't interfere with reading the time. Yahoo Go is not supported on any Sony Ericsson phones, neither is Yahoo ZoneTag. You can download MP3 ringtunes from Sony for free, but it won't let you set them (Rogers prevents you from using MP3s as ringtones). then select your country and phone, and go to "Fun & Downloads". There may also be a built-in link on your phone itself, check your Internet links (click the button on the right face of the phone, between the right -- and the C key, it's the * tab in the display that comes up). Java - Sony Ericsson's Java™ Platform 7 (JP-7) / Java Micro Edition - appears to be the main platform for K790 applications. I really am pleased with the phone overall. I am hoping I can use it in many cases to eliminate carrying an iPod, and in some cases to eliminate carrying a camera. It's unfortunate that in-phone GPS capabilities haven't caught on yet, but I'm sure this is coming within the next couple generations of phones (the Nokia N95 puts a big emphasis on GPS). It's also very unfortunately that the extremely high cost of the Rogers data plan means that I will not be running many otherwise cool Internet/Java applications. Here are some options for M2 memory from Amazon.com. UPDATE 2007-08-13: Added 4GB card. Note: Do not confuse Memory Stick Micro with MicroSD, a completely different, incompatible memory card format. UPDATE 2007-05-05: In the US, you can get cell phones and plans directly through Amazon; the specific offerings depend on your location. Apparently, if you convert your mp3 to wav format you could use it as a ring-tone. Hey. You mention that you can download free MP3's from sony. How and where exactly? Thanks for the full detailed review. Your post helped convince me to try out this fantastic phone. In the US, currently you can take advantage of a lot of the data services using T-mobiles 6$ per month simple data plan. I use RSS feeds all the time, sync my Google Calendars with GooSync, check yahoo mail, sync my contacts with Yahoo address book, stream music from internet radio stations, use it as a Bluetooth modem. The A2DP wireless stereo Bluetooth is good too -- range is about 10 feet though with the MBR-100 receiver I am using. I think the one problem of a device that does soo much, is the joystick is probably going to wear out before I am ready for a new phone -- Guess I should stop playing old nintendo games using the vampent vNes emulator! Just a side note.. I got this phone for Christmas, not terribly impressed with the camera however for quick "check this out" pictures it's more than good enough. I read in your article that blogging isn't supported by Rogers either,thanks--saves me more arguing! The "Blog THis" link WAS there originally, however in the quest for email I foolishly upgraded the phone and since then that option is no longer there.. hmmmmmmm! Another creepy Rogers issue: tried to download a game (yes, for the right phone!) 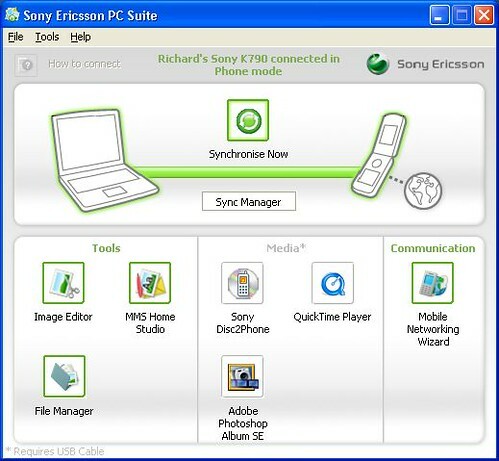 off the Sony Ericsson website... got as far as finding it, get all ready to go, & phone tells me "File type not supported by this phone" Am thinking it's another Rogers issue, as the one I tried from THEIR site works fine.... hmmmmmmmmmmmmmmm again! All in all, it's a neat little package though and it does save me from lugging my fancy camera around "just in case". Great, concise! Question for you: I bought a used k790c after losing my new K790a. I did not realize the difference ie: chineese and lack of updates, it seems to be an older version, and a chineese version. I updated my software via the internet, no difference. Anyway I can convert my k790c into a k790a?????? I miss my Java application for my music and many, many more better features which come standard on the K790a. Damn! Did I make the wrong decision or can I fix this to better resemble my k790a, please, please help me and thanks so, so very much friend! Steve in Toronto. stevedaviesart@rogers.com PS>>>>>I'm with Rogers too, on a 3 year contract, no upgrades available to me, I bought this one from a guy on Craigslist for $150 before I came home and examined it. HELP.